We are seeking a new Senior ASP.NET MVC Web Developer to join our growing team! Apply today! Are you the best .NET developer that you know? Then Solab and Onboard Tracker™ want to hear from you! Our OnboardTracker™ Software as a Service (SaaS) now records Personnel Logistics, Training and Competence data on people attending more than 50% of the rigs in the North Sea and in over 30 countries. We lead the field with the latest tech, we live and breathe development and we need highly engaged and motivated Developers to join our rapidly expanding team in Aberdeen. Solab is one of the longest established IT services, business training & software development companies in Scotland. Based in Aberdeen, we bring knowledge, experience and expertise to the market and we proudly celebrated our 27th anniversary this year. Solab has developed an extensive range of software for local and international organisations; from small departmental applications through to large-scale enterprise platforms; deployed as both Windows and Web applications to users, and as services exposing programmatic interfaces to other systems. Examples of our work include applications, systems and other software supporting daily global operations for: crew tracking, asset management, certification management, vessel availability & brokerage, competency management, helicopter availability etc. 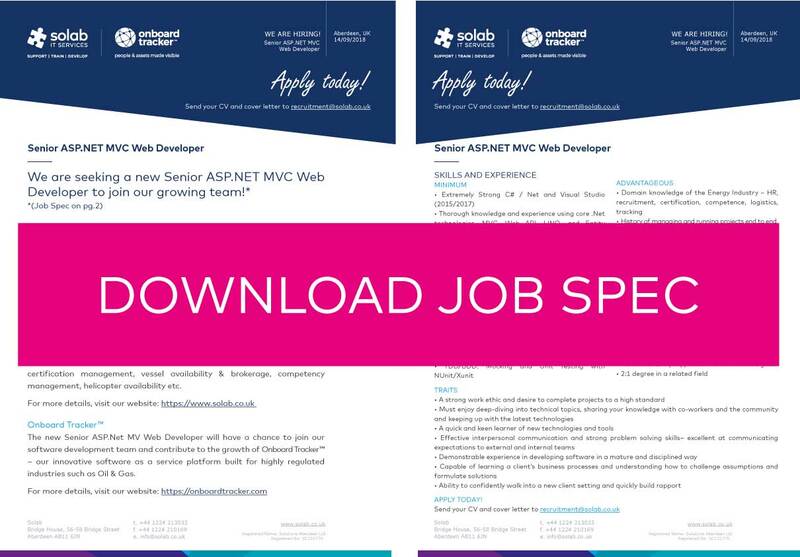 The new Senior ASP.Net MVC Web Developer will have a chance to join our software development team and contribute to the growth of Onboard Tracker – our innovative software as a service platform built for highly regulated industries such as Oil & Gas. Click the image below to download our Job Spec! Deep understanding of DI/IoC with containers like Autofac. Strong Database skills including database design and writing complex queries. Creating Reports/Excel/PDFs etc in Net with SSRS/Power BI etc. Application Insights for debugging/logging and experience with profiling. NOT QUITE GOT THESE SKILLS YET? WE HAVE OTHER DEVELOPER ROLES TOO!